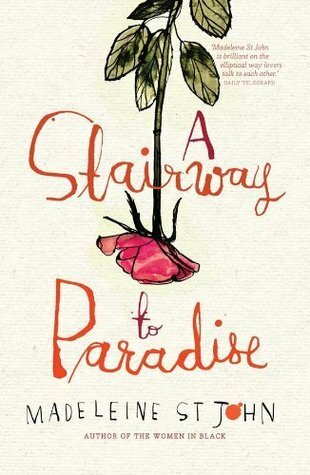 A Stairway to Paradise (1999) was the fourth and final novel of Madeleine St John (1941-2006), the first Australian woman to be shortlisted for the Booker Prize (with The Essence of the Thing, see my review). At 192 pages, it’s only a short novel and I romped through it in an evening, enjoying St John’s wit and perception as she depicts the interior lives of characters caught in the ‘eternal triangle’. But in the cold hard light of morning, it seems a slight piece of work, of interest more for the poignancy of its autobiographical elements than for anything important it might have to say about the human condition. Two very nice blokes, one beautiful woman adopting a lofty moral position rather than break up a marriage – having read Helen Trinca’s biography of St John I found it hard to avoid the conclusion that this is the fantasy version of St John’s failed relationships. Andrew is a very nice man, fresh from a failed marriage. (One wonders why his wife dumped him, since he’s so nice). At a party with his friend Alex, he meets the stunningly beautiful Barbara (domestic goddess, good with children, no uppity career to be accommodated). Alex drives her home from the party where she conspicuously does not invite the men in. Her airy dismissal, however, is no obstacle because the lift home has provided both men with her address. This allows Andrew to pursue balm for his wounded heart, and Alex to restore an adulterous relationship that she had called off some time before. They do not know that they are in competition for the same woman. There is no doubt about who is in control here. The lovely Barbara’s moral compass precludes an affair with Alex, though since that is where her heart lies, Andrew doesn’t stand a chance. The plot twists and turns around Alex’s pompous unwillingness to break up his own loveless marriage ‘for the sake of the children’, a stance at odds with the way society has moved on to accommodate divorce in this period of time. Reading between the lines, Alex is as concerned about carving up his posh house, purchased so prudently before the property book, as he is about his children. He doesn’t want the expense of running two households, so he would rather wait out his youngest child’s childhood with an affair on the side. But for Barbara, the deceitful alternative would destroy the purity of their love. We’ve heard all this before, eh? Barbara’s Australian friend (with an execrable accent that makes her sound, in this most pseudo-British of books, like a Cockney) laughs off Barbara’s retelling of it. The concluding scene representing the children’s attitude towards their parents’ marriage serves only to expose how little St John really knew about children, also in evidence in SuperNanny Barbara’s skill at making brats behave and learn their middle-class table manners. Though of course Barbara is not a Nanny, she’s a temporary au-pair, so much more socially acceptable in St John’s world. (Really, St John’s snobbery is excruciating). Read it for the crisp wit and an evocation of middle-class London life at the turn of the century, but don’t expect much more than that. I read The Women in Black years ago and really enjoyed it–haven’t read this one, but it sounds as though it’s a good read for the right mood. The Women in Black was excellent, I really liked that one. A refreshingly honest review, Lisa! Thank you, Christina – that’s what I always aim for here!